CHURCH OF THE LIVING GOD: THE FOOLISHNESS OF THE CROSS? THE FOOLISHNESS OF THE CROSS? 18 “For the preaching of the cross is to them that perish foolishness; but unto us which are saved it is the power of God. 19For it is written, I will destroy the wisdom of the wise, and will bring to nothing the understanding of the prudent. 20Where is the wise? where is the scribe? where is the disputer of this world? hath not God made foolish the wisdom of this world? 25”Because the foolishness of God is wiser than men; and the weakness of God is stronger than men. I am sometimes amazed at how people of this world cannot grasp the simple language of the Bible. Jesus said that we must become as little children. But the world uses logic and the finite mind to try and understand the wisdom of God who is infinite in knowledge, and love of mankind. You look at a small child and they are so trusting of those who they know loves them. They believe what is told them, even though they may not understand it and follow the commands of their parents...(in most things, as children can be rebellious), but in simple day to day living, when given an explanation of something they may have asked in a one word question “WHY?” they are given the explanation and they believe. Many people just cannot wrap their finite minds around something so simple, but must be accepted in child like faith. You may not understand it, but you accept it because God has said it, and you believe...but some just can't see the forest for the trees. For example, we've examined the nuts-and-bolts answers to hard questions like, "Why did Jesus have to die?" and "would a loving God send people to hell?" etc. But it is good from time to time to revisit the basic gift of salvation. The people I speak of that can't grasp the concept of mercy and grace, think they must do something to warrant God's mercy and grace...like good works, or following rules, or following their denomination's traditions. In other words, they must earn this gift from God. But can you earn a gift? They just can't understand that salvation is for sinners. Maybe you know some people like this. They get hung up in rules and regulations, traditions that speak of works and doing what their “church” says. Then another set of people get hung up on keeping the Law of God, but can't seem to understand that you can't keep the law in its entire application of what God expects from each of us. From law keeping, the law is our school master, but it condemns each one of us, as we can't keep the whole of the law. Love God and love your neighbor as yourself...simple. But when was the last time you loved everyone you meet and love them as yourself?. The world is full of those who in simple language, “are hard to love”. They can get you fired up and thinking inappropriate thoughts about those who offend you, or thoughts of “getting even”. Admit it...we can't love our neighbor (not all of them) as ourselves, it is humanly impossible...some will try, but each of us fail, because “we're human”. We are prone to failure to live up to even this commandment that encompasses the whole of the law. It leads directly to the truth that we can't keep God's Law, and thereby cannot have a personal relationship with God the Father, because of our sin. There is a huge gap between a Holy God and sinful mankind that cannot be bridged on our own. That's where Jesus comes into focus, as the bridge to God the Father. You see, God the Father, being perfectly Holy in all His ways, cannot allow sin into His presence. No matter what we do, we will never qualify as perfect enough, sinless enough to enter into His presence...So that leaves you, that leaves me as sinners on the other side of this huge gap between us and a Holy God. We are ALL selfish sinners, that is why God had to become ONE of us. To do that, God emptied Himself of all His glory, entered into this quarantined sin-soaked world, into our atmosphere and took on human form, conquer sin in this world, and thereby defeating sins stranglehold on all of humanity. And then, having qualified as an acceptable Sacrifice, He paid the eternal penalty for sin on our behalf. 13 “(For until the law sin was in the world: but sin is not imputed when there is no law. 14Nevertheless death reigned from Adam to Moses, even over them that had not sinned after the similitude of Adam's transgression, who is the figure of him that was to come. 15But not as the offence, so also is the free gift. For if through the offence of one many be dead, much more the grace of God, and the gift by grace, which is by one man, Jesus Christ, hath abounded unto many. 16And not as it was by one that sinned, so is the gift: for the judgment was by one to condemnation, but the free gift is of many offences unto justification. 17For if by one man's offence death reigned by one; much more they which receive abundance of grace and of the gift of righteousness shall reign in life by one, Jesus Christ. 22 “And almost all things are by the law purged with blood; and without shedding of blood is no remission. Jesus paid the penalty for the sin that Adam allowed to enter into the world, and to every man since Adam, but Jesus was WITHOUT sin. Having been born of the Father in this sin sick world, Jesus lived the life that God expects from each of us, but was unable to do what He demanded, that in Jesus He defeated the penalty of sin that we deserve. This was mercy and grace. Mercy is defined of being forgiven of something we earned, which was death, and grace receiving what we could not earn, but given as a gift. He defeated sin by His death, but because of His resurrection He justified all who believe in Him and what He accomplished. All of mankind has sinned. It is part of our spiritual DNA, from our original parents that no one can escape. Nobody who ever sinned, even once, has defeated sin personally, and all mankind remains under sin's penalty of death. All mankind is under a curse and without ridding ourselves of the sin we have committed will stand before a righteous judge and be condemned. Death is in two parts. The physical death, and what the Bible calls the 'second death' eternal separation from God in the Lake of Fire. And so is the judgment of a person's life. Those who have accepted Jesus Christ as a little child in that child-like faith have already been judged at the cross of Christ. Their penalty has already been paid. But for those who trust in their own good works to save themselves, there will be a second death before the Great White Throne of God Almighty, where they will be judged for ALL their works, either good or bad. Contrary to some who believe that if they live a good life, and their good works which outweight their bad, will somehow earn them a ticket to heaven will be horrified to learn that they were wrong. But beware if you think such foolishness, as there is no balancing scale with good deeds on one side and bad deeds on the other. Even ONE sin of those standing before God at this judgment will earn them eternal separation from God. THOSE THAT FOUND FAITH IN JESUS CHRIST. When a sinner accepts Jesus Christ as personal Savior, our sin is transferred to our Lord, as the propitiation (substitute) for what we deserve. 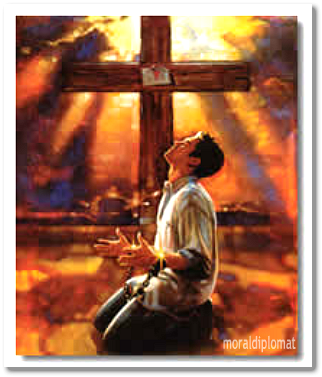 Jesus blood sacrifice on a Roman cross paid our eternal debt from that moment forward on into eternity. There is NOTHING left to judge us on, except what rewards that we will receive at the Bema Judgment Seat of Christ. It is something that we could never earn no matter what we do, because it is a free gift, freely offered to all men. By accepting Jesus' sacrifice on our behalf and committing to follow Him we are declared righteous by God on the basis of our faith. Therefore as new creatures, recreated by the Blood of Christ, wearing His righteousness instead of our own, we are able to come before the throne of God blameless and cleansed, re-establishing our relationship with God. When God the Father will look upon us standing before His throne, He will see nothing but the righteousness of His Son...we are clothed with that righteousness when we confessed our sins, and accepted Jesus Christ as our Savior and the substitute payment for what we did deserve....death, eternal death. No matter what men do, this has nothing to do with religion. Those who promote one religion supreme over another fool themselves that they can somehow do enough righteous acts through their church to qualify somehow to enter into God's Kingdom. Men believe that they have to belong to a certain religion and call it “God's Church” founded by the Lord Jesus Christ. Proper teaching of truth by one's denomination can lead you into the truth found solely in Jesus Christ, but it can do nothing in of itself to justify you, just because you belong to its religion and follow their traditions, no matter how righteous they may seem, it will do nothing for your eternal salvation. But it CAN lead you astray from Jesus as the only payment for that sin. The apostle Paul made that abundantly clear when he was preaching to the church in Galatia, where a false teaching had crept intho their midst that said that Christians had to be circumcised like Jews, in order to prove they belonged to God. Paul corrected those in error that they were neither Jew or Gentile, but a new creature in Christ. For a lot of people, this is a difficult concept to understand exactly what a “new ?creature” is according to scripture and what it is not. The Bible teaches there are four separate spiritual creations of God. Angels were created to serve Almighty God and humanity who would become heirs of salvation, even before man was even created. Some call them guardian angels, and they do watch out for us according to the will of God. Then God created Adam in His image and His likeness. Adam was sinless and designed to live forever as long as he followed the commandments of God..and there was only one...not to eat of one particular tree...sounds simple, doesn't it? At Adams fall, his spiritual state changed as he became separated from God because of his sin and became the father of unregenerate Gentiles. Adam willfully rebelled against God's command. Some say it was out of love for Eve, who was deceived, but Adam was not. Then there is Abraham, through faith, fathered the first of another new spiritual creation. Isaac was the first spiritual Jew, the father of Jacob, whose name was changed to Israel. Since then, every person is born either a Jew or a Gentile, from the perspective of their spiritual state of existence. For simplicity, we speak of them as Jews, but it is more correct that God separated out a member of the Hebrew race. The first three sentient, spiritual creations of God, then, are angels, Jews and Gentile, descended from Adam, but in God's Image, with an eternal spirit. From that point, God dealt with Jew and Gentiles separately. A Jew would always be a Jew in God's eyes, and a Gentile could be a practicing Jew. A Jew could never be a Gentile, but they both were estranged from God apart from Jesus Christ. They were both still in their sins that separated them from their Maker. At the resurrection of Jesus Christ, God introduced a new Spiritual Creation. All through the Old Testament there are scriptures that prove that man was made in the image of God, but beginning with the New Testament, the image of God makes a very decided shift. Jesus the second Adam, the man from Heaven, (as the Bible calls Him) or as John said “the eternal Word, is in the image of God in the flesh. Not mankind in general. Jesus introduced a new spiritual creation with His resurrection. Those who trust Jesus are transformed into a totally new spiritual creation, personally indwelt by the Holy Spirit of God, and restored to the fellowship lost by Adam. Each of us, meaning forgiven sinners have received an earnest deposit of God's Holy Spirit (earnest meaning deposit) guaranteeing our future glorification. Having been MADE righteous and restored to fellowship, Christians are neither Gentile nor Jew. Nor are they angels, either literally or figuratively. The Bible calls them 'saints' -- something entirely unique in the history of the universe. Either Jew or Gentile, they remain who they are, but a Christian who accepts Jesus Christ is REBORN into a new birth, a new spiritual creation of God. 3”Jesus answered and said unto him, Verily, verily, I say unto thee, Except a man be born again, he cannot see the kingdom of God. 4Nicodemus saith unto him, How can a man be born when he is old? can he enter the second time into his mother's womb, and be born? 5Jesus answered, Verily, verily, I say unto thee, Except a man be born of water and of the Spirit, he cannot enter into the kingdom of God. 6That which is born of the flesh is flesh; and that which is born of the Spirit is spirit. 7Marvel not that I said unto thee, Ye must be born again. Salvation is a permanent transformation from one kind of spiritual creation to a different kind of spiritual creation. It is the misunderstanding of the new creature that is a stumbling-block to grasping the simple assurances of the Gospel. The Bible says to repent (literally, change your mind), realizing your sin will take you to hell, and that there is nothing you can do about it except to trust Jesus' promise that by trusting Him for your salvation as the Lord of your life, you are now a new creation of God. It's so simple. So simple, but in fact, that there are millions upon millions who just can't get it. Paul spoke of being "wise in your own conceits" (Romans 12:16) not the least of which is the belief that our works contribute to our salvation. If Jesus didn't do it all, then He didn't have to do it at all and He died in vain. 16 “For God so loved the world, that he gave his only begotten Son, that whosoever believeth in him should not perish, but have everlasting life. 17For God sent not his Son into the world to condemn the world; but that the world through him might be saved. 18He that believeth on him is not condemned: but he that believeth not is condemned already, because he hath not believed in the name of the only begotten Son of God. 9 “The Lord is not slack concerning his promise, as some men count slackness; but is longsuffering to us-ward, not willing that any should perish, but that all should come to repentance. There is coming a day when Jesus will come and those not found in Him will be thrown headlong into the coming Tribulation. But that is not what this message is about. Prophecy is usually my main focus, but without Jesus, prophecy means nothing. Prophecy covers what Jesus has done, what He will do, and that He calls each of us by His Holy Spirit. If you have heard that call, don't put it off one day longer, as the window of your salvation could close abruptly, for we are not promised even tomorrow.